Both up-and-coming and established businesses are choosing to purchase space at IRONWORKS – not only for the appeal of our East Vancouver commercial real estate development from a business perspective – but for the community in which it resides. 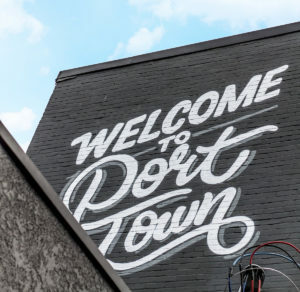 Port Town and the surrounding neighbourhoods, such as Grandview-Woodland and Commercial Drive, are steeped in history, dynamic and ever-changing, full of sights, culture and an eclectic mix of amenities you don’t typically find in other parts of Vancouver. This diversity is present, not only in the people, but also in the array of choices offered by local purveyors of fine food and drink that make this community so sought after. The following is a handful of new and interesting neighbourhood eateries (and “drinkeries”) where you can wet your whistle or satisfy your hunger. Open Wednesday to Saturday, 6:00pm – late. Trans Am serves carefully crafted cocktails, craft beer, BIG burgers, rib-eye, antipasto and charcuterie. The menu changes frequently. The atmosphere is cozy and rustic. The experience is homey and laid back and the cocktails are liquid art. They don’t have a website but can be found on Facebook (link above). Reviews for this establishment are very good. It’s small and can get busy, but well worth trying your luck or getting there early. Open Thursday to Saturday, 6pm to 12:00am. “Canadian Whisky” and “Rye Whisky” are synonymous terms, though in reality, many Canadian ryes are not made from rye or use little of it. Resurrection Spirits wants to change that, aiming to put the rye back in rye whisky and embracing a traditional distilling process that uses the best locally sourced grain to achieve the best output from the distillery. It’ll take a few years before the company can officially call their offering a “whisky”, but it certainly is “rye”. Resurrection Spirits distils hand-made spirits from organic rye, fruit, botanicals and spices, currently producing a white rye and in the future will produce a whisky and gin. Spirits may be purchased by the bottle or as part of a cocktail in the tasting room. Open Monday to Sunday, 12pm to 10pm. Earnest Ice Cream is a modern-day twist on the old-fashioned ice cream parlour with a passion for flavour, freshness and environmentally-friendly business practices. With 12 regular flavours, 8 vegan ice creams and a rotating menu of special flavours, everyone will find a favourite. Earnest Ice Cream is locally owned and operated. Their ice cream is made fresh with locally-sourced ingredients in a business that employs sustainable processes. Grab a cone or take some home in a returnable glass jar. Try a sundae with all the toppings or have a latte, americano, affogato or hot chocolate. Open Wednesday – Saturday, 11am – 6pm; Sunday, 11am-5pm. The Pie Shoppe, is well…a pie shop, but a very a special one at that. Stephanie and Andrea French have taken the “farm to fork” concept and applied it to their pie artistry. They use organic, green ingredients such as organic Okanagan fruit and unbleached organic flour. 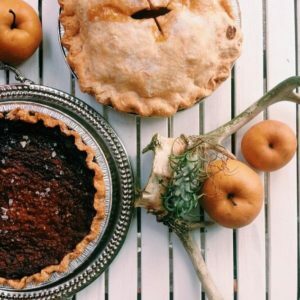 The Pie Shoppe’s menu features approximately 20 pies including apple, salted chocolate peanut butter, seasonal, savoury and more – all made fresh daily. The shop also hosts pie-making workshops, takes special orders for wedding pies, and can be booked for events. Back in February, the shop experienced a fire in what its owners are calling the “Piepocalypse of 2018”. Nobody was hurt, thankfully, but water and smoke damage necessitated a renovation. If you want to help the Pie Shoppe get through this calamity, you can buy “pie dollars” (Pie Shoppe gift cards for use in the future) by visiting the Pie Shoppe GoFundMe page. The Pie Shoppe is scheduled to re-open near Easter. Open Wednesday to Sunday. Lunch/brunch: 10am – 2pm. Dinner: 5pm – 10pm. 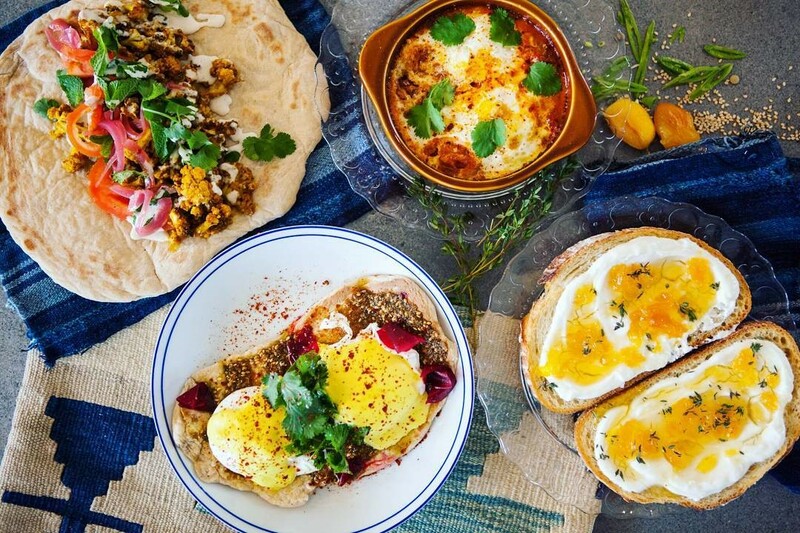 Haitham El Khatib, Aleph’s owner, has created a restaurant, bakery, café and bar that draws its inspiration from Middle Eastern staples, with a personal twist. As Haitham explains on their website, Aleph “offers a borderless experience that does not belong to countries, religions or races” because “food does not take sides”. We won’t give away the meaning of “Aleph”, because Haitham describes it best. Aleph’s vegetarian menu offers a variety of starters (“Mezze”), salads, mains “Plates”, alcoholic and non-alcoholic drinks, and sweets. Appetizers include Hummus, Baba Ganouj (eggplant dip), Muhammara (red pepper, walnuts and lemon zest dip) and others. Mains include Persian Herb Lentil Rice, Halloumi Grilled Cheese Sandwich with fig jam, Turmeric Cauliflower and other tasty dishes. Open Monday to Friday, 8:30am to 6pm; Saturday, 8am to 5:30pm; Sunday, 10am to 4pm. Bosa Foods is a veteran amongst Vancouver specialty food companies that was started in 1957 by Augusto Bosa, an Italian food importer. Now, run by a third generation of Vancouver Bosas, the store boasts a large retail distribution centre with several locations, selling over 7,000 SKUs of Italian and Mediterranean food. If you’re in East Vancouver and hungry for lunch though, it’s the deli that will draw you in. You’ll find a variety of fresh soups and salads, pasta, prepared sandwiches, grilled panini, baked treats and coffees. There are far too many goodies offered to list here, so check out the Bosa deli menu. IRONWORKS owners tell us that IRONWORKS unique, flex-use, stacked office, warehouse and industrial spaces are the right real estate development investment for Vancouver-based business owners looking to buy into their future, rather than lease space. They also tell us they love the neighbourhood: a vibrant, colourful part of the city with history and a lot to offer both its residents and businesses. Curious? Contact us to book a viewing.